This topic discusses audio latency changes in Windows 10. It covers API options for application developers as well as changes in drivers that can be made to support low latency audio. Describe the sources of audio latency in Windows. Explain the changes that reduce audio latency in the Windows 10 audio stack. The new AudioGraph API for interactive and media creation scenarios. Changes in WASAPI to support low latency. Enhancements in the driver DDIs. Delay between the time that an application submits a buffer of audio data to the render APIs, until the time that it is heard from the speakers. Delay between the time that a sound is captured from the microphone, until the time that it is sent to the capture APIs that are being used by the application. Delay between the time that a sound is captured from the microphone, processed by the application and submitted by the application for rendering to the speakers. It is roughly equal to render latency + capture latency. Delay between the time that a user taps the screen until the time that the signal is sent to the application. Delay between the time that a user taps the screen, the event goes to the application and a sound is heard via the speakers. It is equal to render latency + touch-to-app latency. The following diagram shows a simplified version of the Windows audio stack. The Audio Engine reads the data from the buffer and processes it. It also loads audio effects in the form of Audio Processing Objects (APOs). For more information about APOs, see Windows Audio Processing Objects. The latency of the APOs varies based on the signal processing within the APOs. The Audio driver reads the data from the buffer and writes them to the H/W. The H/W also has the option to process the data again (in the form of additional audio effects). The user hears audio from the speaker. Audio is captured from the microphone. The H/W has the option to process the data (i.e. to add audio effects). The driver reads the data from the H/W and writes the data into a buffer. Before Windows 10, this buffer was always set to 10ms. Starting with Windows 10, the buffer size is defined by the audio driver (more details on this below). The Audio Engine reads the data from the buffer and processes them. It also loads audio effects in the form of Audio Processing Objects (APOs). Before Windows 10, the latency of the Audio Engine was equal to ~6ms for applications that use floating point data and ~0ms for applications that use integer data. In Windows 10, the latency has been reduced to ~0ms for all applications. The application is signaled that data is available to be read, as soon as the audio engine finishes with its processing. The audio stack also provides the option of Exclusive Mode. In that case, the data bypasses the Audio Engine and goes directly from the application to the buffer where the driver reads it from. However, if an application opens an endpoint in Exclusive Mode, then there is no other application that can use that endpoint to render or capture audio. Another popular alternative for applications that need low latency is to use the ASIO (Audio Stream Input/Output) model, which utilizes exclusive mode. After a user installs a 3rd party ASIO driver, applications can send data directly from the application to the ASIO driver. However, the application has to be written in such a way that it talks directly to the ASIO driver. Both alternatives (exclusive mode and ASIO) have their own limitations. They provide low latency, but they have their own limitations (some of which were described above). As a result, Audio Engine has been modified, in order to lower the latency, while retaining the flexibility. All applications that use audio will see a 4.5-16ms reduction in round-trip latency (as was explained in the section above) without any code changes or driver updates, compared to Windows 8.1. a. Applications that use floating point data will have 16ms lower latency. b. Applications that use integer data will have 4.5ms lower latency. Systems with updated drivers will provide even lower round-trip latency: a. Drivers can use new DDIs to report the supported sizes of the buffer that is used to transfer data between the OS and the H/W. This means that data transfers do not have to always use 10ms buffers (as they did in previous OS versions). Instead, the driver can specify if it can use small buffers, e.g. 5ms, 3ms, 1ms, etc. b. Applications that require low latency can use new audio APIs (AudioGraph or WASAPI), in order to query the buffer sizes that are supported by the driver and select the one that will be used for the data transfer to/from the H/W. AudioGraph callbacks on the streaming path. If the application uses WASAPI, then only the work items that were submitted to the Real-Time Work Queue API or MFCreateMFByteStreamOnStreamEx and were tagged as "Audio" or "ProAudio". Favor AudioGraph, wherever possible for new application development. You need additional control than that provided by AudioGraph. You need lower latency than that provided by AudioGraph. The measurement tools section of this topic, shows specific measurements from a Haswell system using the inbox HDAudio driver. The following sections will explain the low latency capabilities in each API. As it was noted in the previous section, in order for the system to achieve the minimum latency, it needs to have updated drivers that support small buffer sizes. Sets the buffer size to be either equal either to the value defined by the DesiredSamplesPerQuantum property or to a value that is as close to DesiredSamplesPerQuantum as is supported by the driver. Allow an application to discover the range of buffer sizes (i.e. periodicity values) that are supported by the audio driver of a given audio device. This makes it possible for an application to choose between the default buffer size (10ms) or a small buffer (<10ms) when opening a stream in shared mode. If an application does not specify a buffer size, then it will use the default buffer size. Allow an application to discover the current format and periodicity of the audio engine. This allows applications to snap to the current settings of the audio engine. The above features will be available on all Windows devices. However, certain devices with enough resources and updated drivers will provide a better user experience than others. The above functionality is provided by a new interface, called IAudioClient3, which derives from IAudioClient2. The WASAPIAudio sample (available on GitHub: https://github.com/Microsoft/Windows-universal-samples/tree/master/Samples/WindowsAudioSession) shows how to use IAudioClient3 for low latency. The following code snippet shows how a music creation app can operate in the lowest latency setting that is supported by the system. Also, it is recommended for applications that use WASAPI to also use the Real-Time Work Queue API or the MFCreateMFByteStreamOnStreamEx to create work items and tag them as Audio or Pro Audio, instead of their own threads. This will allow the OS to manage them in a way that will avoid interference non-audio subsystems. In contrast, all AudioGraph threads are automatically managed correctly by the OS. The following code snippet from the WASAPIAudio sample shows how to use the MF Work Queue APIs. Alternatively, the following code snippet shows how to use the RT Work Queue APIs. The render signal for a particular endpoint might be sub-optimal. The capture signal might come in a format that the application cannot understand. The latency might be improved. [Mandatory] Declare the minimum buffer size that is supported in each mode. [Optional, but recommended] Improve the coordination for the data flow between the driver and the OS. [Optional, but recommended] Register the driver resources (interrupts, threads), so that they can be protected by the OS in low latency scenarios. HDAudio miniport function drivers that are enumerated by the inbox HDAudio bus driver hdaudbus.sys do not need to register the HDAudio interrupts, as this is already done by hdaudbus.sys. However, if the miniport driver creates its own threads, then it needs to register them. The following three sections will explain each new feature in more depth. 1. Declare the minimum buffer size. A driver operates under various constraints when moving audio data between the OS, the driver, and the hardware. These constraints may be due to the physical hardware transport that moves data between memory and hardware, and/or due to the signal processing modules within the hardware or associated DSP. In Windows 10 the driver can express its buffer size capabilities using the DEVPKEY_KsAudio_PacketSize_Constraints device property. This property allows the user to define the absolute minimum buffer size that is supported by the driver, as well as specific buffer size constraints for each signal processing mode (the mode-specific constraints need to be higher than the drivers minimum buffer size, otherwise they are ignored by the audio stack). For example, the following code snippet shows how a driver can declare that the absolute minimum supported buffer size is 1ms, but default mode supports 128 frames (which corresponds to 3 ms, if we assume 48 kHz sample rate). Also, the sysvad sample (https://github.com/Microsoft/Windows-driver-samples/tree/master/audio/sysvad) shows how to use these properties, in order for a driver to declare the minimum buffer for each mode. 2. Improve the coordination between driver and OS. Clearly indicate which half (packet) of the buffer is available to the OS, rather than the OS guessing based on a codec link position. This helps the OS to recover from audio glitches faster. Optionally optimize or simplify its data transfers in and out of the WaveRT buffer. The amount of benefit here depends on DMA engine design or other data transfer mechanism between the WaveRT buffer and (possibly DSP) hardware. "Burst" captured data faster than real-time if the driver has internally accumulated captured data. This is primarily intended for voice activation scenarios but can apply during normal streaming as well. Provide timestamp information about its current stream position rather than the OS guessing, potentially allowing for extremely accurate position information. This DDI is very useful in the case, where an DSP is used. However, a standard HD Audio driver or other simple circular DMA buffer designs might not find much benefit in these new DDIs listed here. Several of the driver routines return Windows performance counter timestamps reflecting the time at which samples are captured or presented by the device. In devices that have complex DSP pipelines and signal processing, calculating an accurate timestamp may be challenging and should be done thoughtfully. The timestamps should not simply reflect the time at which samples were transferred to or from the OS to the DSP. To calculate the performance counter values, the driver and DSP might employ some of the following methods. Within the DSP, track sample timestamps using some internal DSP wall clock. Between the driver and DSP, calculate a correlation between the Windows performance counter and the DSP wall clock. Procedures for this can range from very simple (but less precise) to fairly complex or novel (but more precise). Factor in any constant delays due to signal processing algorithms or pipeline or hardware transports, unless these delays are otherwise accounted for. The sysvad sample (https://github.com/Microsoft/Windows-driver-samples/tree/master/audio/sysvad) shows how to use the above DDIs. To help ensure glitch-free operation, audio drivers must register their streaming resources with portcls. This allows the OS to manage resources to avoid interference between audio streaming and other subystems. Stream resources are any resources used by the audio driver to process audio streams or ensure audio data flow. At this time, only two type of stream resources are supported: interrupts and driver-owned threads. Audio drivers should register a resource after creating the resource, and unregister the resource before deleted it. Audio drivers can register resources at initialization time when the driver is loaded, or at run-time, for example when there is an I/O resource rebalance. Portcls uses a global state to keep track of all the audio streaming resources. In some use cases, such as those requiring very low latency audio, the OS attempts to isolate the audio driver's registered resources from interference from other OS, application, and hardware activity. The OS and audio subsystem do this as-needed without interacting with the audio driver, except for the audio driver's registration of the resources. The audio miniport driver is the bottom driver of its stack (interfacing the h/w directly), in this case, the driver knows its stream resources and it can register them with Portcls. The audio miniport driver is streaming audio with the help of other drivers (example audio bus drivers). These other drivers also use resources that must be registered with Portcls. These parallel/bus driver stacks can expose a public (or private interface, if a single vendor owns all the drivers) that audio miniport drivers use to collect this info. notifies Portcls that the children's resources depend on the parent's resources. In the HD audio architecture, the audio miniport driver just needs to register its own driver-owned thread resources. HDAudio miniport function drivers that are enumerated by the inbox HDAudio bus driver hdaudbus.sys do not need to register the HDAudio interrupts, as this is already done by hdaudbus.sys. However, if the miniport driver creates its own threads, then it needs to register them. Drivers that link with Portcls only for the purpose of registering streaming resources must update their INFs to include/needs wdmaudio.inf and copy portcls.sys (and dependent files). A new INF copy section is defined in wdmaudio.inf to only copy those files. Audio drivers that must run on a down-level OS can use the following interface (the miniport can call QueryInterface for the IID_IPortClsStreamResourceManager interface and register its resources only when PortCls supports the interface). Finally, drivers that link-in PortCls for the sole purpose of registering resources must add the following two lines in their inf's DDInstall section. Audio miniport drivers do not need this because they already have include/needs in wdmaudio.inf. The above lines make sure that PortCls and its dependent files are installed. Under Sound video and game controllers, double click on the device that corresponds to your internal speakers. In the next window, go to the Driver tab. Select Update driver -> Browse my computer for driver software -> Let me pick from a list of device drivers in this computer -> Select High Definition Audio Device and click Next. If a window titled "Update driver warning" appears, click Yes. If you are asked to reboot the system, select Yes to reboot. After reboot, the system will be using the inbox Microsoft HDAudio driver and not the 3rd-party codec driver. Remember which driver you were using before, so that you can fallback to that driver, if you want to use the optimal settings for your audio codec. 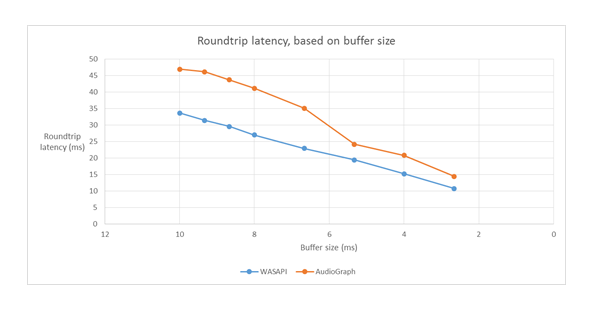 AudioGraph adds one buffer of latency in the capture side, in order to synchronize render and capture (which is not provided by WASAPI). This addition simplifies the code for applications written using AudioGraph. There is an additional buffer of latency in AudioGraph's render side when the system is using > 6ms buffers. 1. Wouldn't it be better, if all applications use the new APIs for low latency? Doesn't low latency always guarantee a better user experience for the user? Low latency means higher power consumption. If the system uses 10ms buffers, it means that the CPU will wake up every 10ms, fill the data buffer and go to sleep. However, if the system uses 1ms buffers, it means that the CPU will wake up every 1ms. In the second scenario, this means that the CPU will wake up more often and the power consumption will increase. This will decrease battery life. Most applications rely on audio effects to provide the best user experience. For example, media players want to provide high-fidelity audio. Communication applications want to minimum echo and noise. Adding these types of audio effects to a stream increases its latency. These applications are more interested in audio quality than in audio latency. In summary, each application type has different needs regarding audio latency. If an application does not need low latency, then it should not use the new APIs for low latency. 2. Will all systems that update to Windows 10 be automatically update to support small buffers? Also, will all systems support the same minimum buffer size? No. In order for a system to support small buffers, it needs to have updated drivers. It is up to the OEMs to decide which systems will be updated to support small buffers. Also, newer systems are more likey to support smaller buffers than older systems (i.e. the latency in new systems will most likely be lower than older systems). 3. 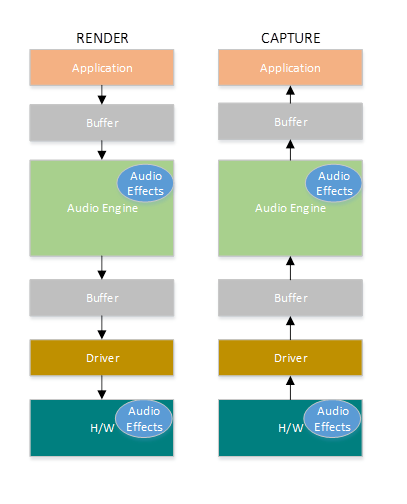 If a driver supports small buffer sizes (<10ms buffers), will all applications in Windows 10 automatically use small buffers to render and capture audio? No. By default, all applications in Windows 10 will use 10ms buffers to render and capture audio. If an application needs to use small buffers, then it needs to use the new AudioGraph settings or the WASAPI IAudioClient3 interface, in order to do so. However, if one application in Windows 10 requests the usage of small buffers, then the Audio Engine will start transferring audio using that particular buffer size. In that case, all applications that use the same endpoint and mode will automatically switch to that small buffer size. When the low latency application exits, the Audio Engine will switch to 10ms buffers again.